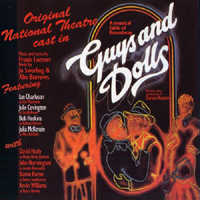 Broadway Cast, 1976 (Motown) (3 / 5) For this revival of Guys and Dolls with an all-black cast, the original orchestrations were rewritten to achieve a funkier sound. Some of the songs resist that kind of treatment, but one of the times when it really works is in the first duet for Sky and Sarah. Ernestine Jackson sings “I’ll Know” with a solid soprano in a standard Broadway arrangement; then James Randolph swings into an R&B chorus of the song, and the two very different styles of singing tell us much about who these characters are. Later, Jackson’s Sarah loosens up in “If I Were a Bell,” and her voice meshes attractively with Randolph’s in “I’ve Never Been in Love Before.” The new orchestrations may not please traditionalists, but their bounciness and the sense of joy that they create cannot be denied. Robert Guillaume portrays a very dry, leading-mannish Nathan Detroit, and Norma Donaldson is an entertaining Adelaide; her shrieks at the end of “Adelaide’s Lament” are unexpected and very funny. This recording also includes “Adelaide Meets Sarah,” a brief sequence in which “I’ve Never Been in Love Before” is sung in counterpoint with “Adelaide’s Lament,” as it appears in the original score. Ken Page’s “Sit Down, You’re Rockin’ the Boat” is a foot-stomping showstopper with a gospel-style encore included. Though this is by no means a definitive Guys and Dolls, it’s a highly enjoyable listening experience. — J.D. National Theatre Cast, 1982 (Chrysalis/Music For Pleasure) No stars; not recommended. Perhaps it’s necessary to have seen this production to understand why it was a resounding hit in London. The “band” was onstage, playing new orchestrations intended to evoke the Big Band sound of the 1940s. But this sounds like a cheaply produced studio recording of Guys and Dolls, rather than a first-class cast album, and much of what Loesser wrote seems to have been lost. The performances were reportedly wonderful onstage but did not translate well to CD. Ian Charleson as Sky never pretended to be a singer, and his acting does not compensate for his lack of vocal power. Julie Covington’s fluttery vibrato makes her renditions of Sarah Brown’s songs virtually colorless. The Adelaide of the usually brilliant Julia McKenzie doesn’t really register, nor does the Nathan Detroit of Bob Hoskins. David Healy’s “Sit Down, You’re Rockin’ the Boat” is standard issue. Overall, this disc is a huge disappointment. At least Music For Pleasure is a budget label! [Ed. 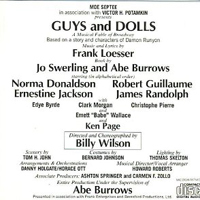 Note: The original London production of Guys and Dolls was in 1953, but while some of the stars recorded some of the songs, nothing close to a complete cast album was released.] — J.D. Studio Cast, 1986 (JAY, 2CDs) (5 / 5) If you must choose only one recording of Guys and Dolls to own, this gem should be it. It contains almost every note of the score as originally heard on Broadway and presents the original orchestrations and dance arrangements in stereo for the first and, so far, only time. It also has bonus tracks of songs written for the film (“Pet Me, Poppa,” “Adelaide,” and “A Woman in love”), with excellent orchestrations by Larry Moore, and the deleted Sky/Nathan duet “Travelin’ Light.” Gregg Edelman’s Sky and Emily Loesser’s Sarah are nothing less than superb, both vocally and dramatically; to hear them perform the “I’ll Know” sequence is almost as if to experience it for the first time. Another joy of this two-disc set is that it includes the entire musical scene of “My Time of Day” into “I’ve Never Been in love Before” as Loesser conceived it. This is also the only recording of the show to include the entire original “Havana” sequence. Kim Criswell is a divine Adelaide, both brassy and touching. As Nicely-Nicely, Don Stephenson successfully accomplishes the unenviable task of following in Stubby Kaye’s footprints. If Tim Flavin is not ideal as Nathan, he’s suitable enough, and Ron Raines is a strong-voiced Sky Masterson. 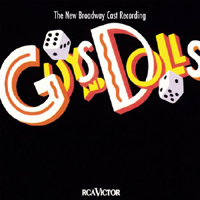 While some listeners may prefer a cast album of Guys and Dolls that represents an actual stage production, this recording offers so much in the way of theatrical atmosphere and excellent performances, not to mention completeness, that it should be a part of every collection. — J.D. Broadway Cast, 1992 (RCA) (3 / 5) Here is the cast recording of a hugely successful revival of this great show. Nathan Lane may not be everybody’s idea of Nathan Detroit, but he’s wonderfully comic, sings better than the role’s requirements, and is especially effective in “Sue Me” with Faith Prince as Adelaide. Prince’s characterization is somewhat lacking in vulnerability, but her comedic instincts are dead-on; she does a bang-up job with “Adelaide’s Lament,” and is obviously having a ball in “A Bushel and a Peck” and “Take Back Your Mink.” Josie de Guzman’s lackluster Sarah lets Prince down in “Marry the Man Today,” and is even more harmful in her duets with Peter Gallagher, who is suave, tough, and in fine voice as Sky Masterson. Gallagher does justice to the rousing “Luck Be a lady” (heard here with new dance music) and “My Time of Day.” The recording includes chunks of dialogue that give it a nice sense of theatricality. Although Walter Bobbie is an unconventional choice for the role of Nicely-Nicely Johnson, he makes the role his own; he leads a rousing “Sit Down, You’re Rockin’ the Boat,” and he and J.K. Simmons give an excellent rendition of the title song. The cuts, however small, and re-orchestrations of much of the score (Michael Starobin is billed after the original orchestrators) may limit some listeners’ enjoyment of this performance, but it is strongly conducted by Edward Strauss. — J.D. 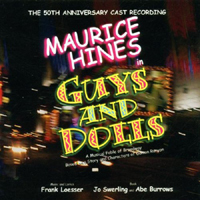 Touring Cast, 2001 (DRG) (1 / 5) This 50th-anniversary recording of Guys and Dolls features the cast of a touring production that began at Washington, D.C’s Arena Stage, with Maurice Hines top-billed as Nathan. Musical supervision and additional arrangements are by Danny Kosarin. The orchestrations sound like scaled-down versions of the originals, with some alterations. Overall, it’s a pretty lifeless affair with the exception of the Sky and Sarah, very well sung by real-life newlyweds Brian Sutherland and Diane Sutherland. Alexandra Foucard is bland in Adelaide’s two performance numbers, and makes dreadful attempts at humor. Even worse is her duet with Hines; to say that this rendition of “Sue Me” is of a community theater level would be insulting to community theaters everywhere. The recording goes further downhill with the worst “Sit Down, You’re Rockin’ the Boat” ever captured on disc, and an awful “Marry the Man Today” with an inexplicable female back-up chorus at the end. 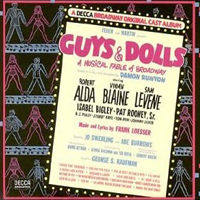 The bonus tracks are a plus: Frank Loesser sings seven Guys and Dolls songs, including the deleted “Travelin’ Light” and “Adelaide” from the film version. His revelatory performance of “Luck Be a Lady” should be required listening for any would-be Sky Masterson; his original verse-and-chorus ballad version of “Sue Me” is fascinating, and it’s fun to hear his renditions of “I’ll Know,” “I’ve Never Been in Love Before,” and “Sit Down, You’re Rockin’ the Boat.” These selections are also available on DRG’s An Evening With Frank Loesser, which includes Loesser’s performances of many other songs from other shows of his. 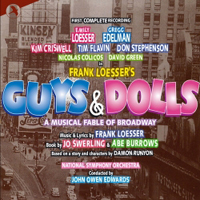 That recording would be a much better purchase than this touring cast album of Guys and Dolls. — J.D.